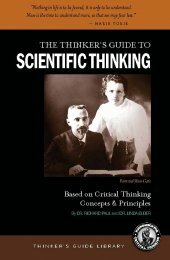 This guide consists of the essence of scientific thinking concepts and tools. It can be used as a supplement to any science textbook, for any science class. The essence of scientific thinking concepts and tools. It focuses on the intellectual skills inherent in the well cultivated scientific thinker. A critical approach to learning science is concerned less with accumulating undigested facts and scientific definitions and procedures, than with learning to think scientifically. As we learn to think scientifically, we inevitably organize and internalize facts, learn terminology, and use scientific procedures. But we learn them deeply, because they are tied into ideas we have thought through, and hence do not have to “re-learn” later. A critical approach to learning science requires us to ponder questions, propose solutions, and think through possible experiments. • communicates effectively with others in proposing solutions to complex scientific problems. Scientific thinking is, in short, self-directed, self-disciplined, self-monitored, and self-corrective. It presupposes assent to rigorous standards of excellence and mindful command of their use. It entails effective communication and problem solving abilities as well as a commitment to developing scientific skills, abilities, and dispositions. This guide is designed for students and faculty. It consists of the essence of scientific thinking concepts and tools. For faculty it provides a shared concept of scientific thinking. For students it is a scientific thinking supplement to any textbook for any science course. Faculty can use it to design science instruction, assignments, and tests. Students can use it to improve their perspective in any domain of science.